This was Coco’s first ever one day event so we set out with the intention that it was more a learning experience for her than anything else. Before today she had never done a dressage test or a show jumping round on grass and never any competitive cross country. Coco is very nervous of other horses when being ridden so gets very tense in warm up areas. Luckily at Chilham the dressage warm up area is large so I took her over to a quiet corner. She worked in fairly well but still felt very tight and tense through her transitions. This carried through to the test where she didn’t flow as nicely as I know she can and lost marks for some over exuberant canter transitions! Overall I was pleased with the test but with plenty of areas to improve on. We got a mark of 37.5 which seemed harsh but after looking at the rest of her sections marks it was in fact in the top half. Coco’s excitement of being at her first event got to her in the showjumping warm up and I paid the price! She broncked mid canter and let me do a ground inspection, I can safely say that it was firm! Whilst dusting myself off the collecting ring steward was calling for us to go in so I quickly got back on, popped a fence then took Coco into the ring. She behaved much better when she had to and wasn’t phased by the surrounding trade stands. She jumped a super round, clear without any problems. 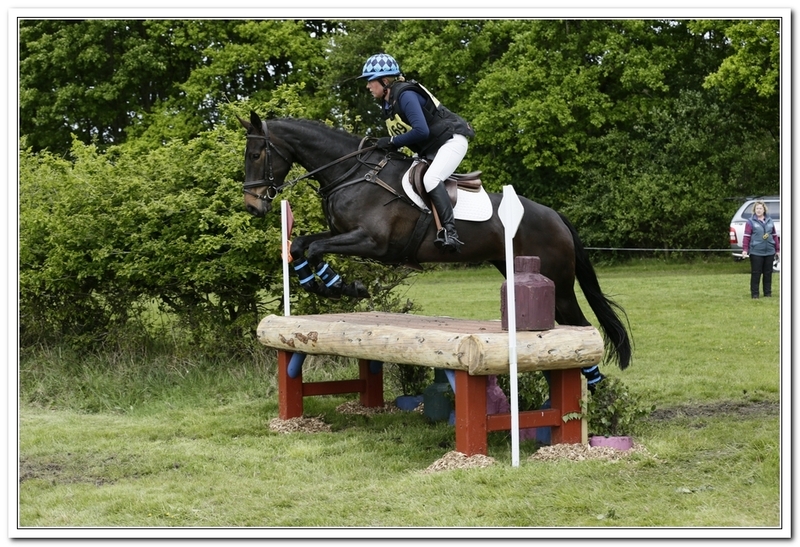 Onto the cross country and Coco had never jumped a course of solid fences before. I had taken her cross country schooling a few times but in a competitive environment it can be quite a different experience. She came out of the start box a little cautiously but jumped the first few jumps without any resistance. At the first combination I rode her in steadily to give her time to see what was coming and she broke trot and jumped both elements in trot. I then pushed her on to be a bit bolder and she responded well. By mid way through the course she had found a nice canter rhythm and her confidence grew throughout. Coco finished the course with no jumping faults and just a few time faults to add. For her first ever event to finish with a double clear was amazing and the icing on the cake was to then discover that she had placed 10th. 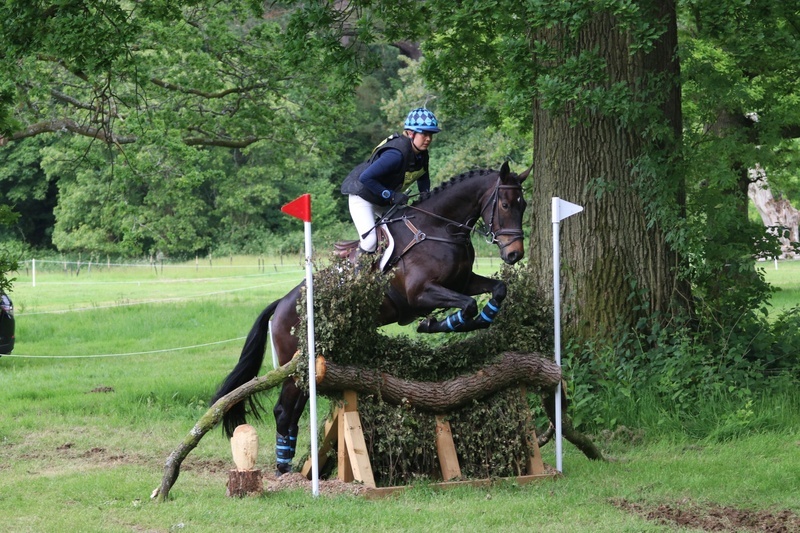 A super start to her eventing career! After a long slow journey to Tweseldown, Coco came off the lorry and was quite relaxed in the dressage warm up. She worked very nicely and I was ready to go into my test slightly ahead of schedule. However in the grass arena Coco then decided that she was actually quite excited and became a handful through the test. There were a few major hiccups which disrupted the test and I found it hard to get her going in a nice forward rhythm as she was so tense. I was quite disappointed as she had done a lovely test at combined training just a few days before; however, I can’t be too disappointed with her as this is only her second test on grass and I know that she can do much better once she gets used to the environment of eventing dressage. The showjumping course was not riding that well and clear rounds were at a premium. Coco was equally as excited as she had been in the dressage but luckily I was able to channel this energy into her jumping and managed to jump a clear round. It wasn’t perfect as she was getting quite keen to get to the jumps but I would rather that than a horse that doesn’t want to jump them. Onto the cross country, which had been causing even more problems than the showjumping. It was quite a demanding course for this level with a few questions dotted around the course, especially the “bogey” fence of the day – a skinny duck coming out of the water. As I walked the cross country it seemed like every other horse was having problems at this one particular fence. As I warmed Coco up for the cross country she still had lots of energy to spare and was being a bit naughty! I spent much of it holding onto the neck strap! Luckily I didn’t have to wait too long until I was called over to the start box. Coco came out of the start box and was a little hesitant to the first jump, however with a bit of positive riding she jumped it and was onto the next. Over the first few jumps Coco was good however in between them she was a little reluctant to travel forward in a nice forward canter. Then came the first water and the dreaded dark! Coco hesitated and leapt sideways before entering the water and what I didn’t realise at the time was that she managed to pull a front shoe off. Due to this I was unable to ride the line I had hoped to get to the dark and got there in trot, she wasn’t sure about the look of the duck but was honest enough to jump it, albeit not in the most confident manner. I gave her a huge pat whilst driving her forward to the next. It took a few more fences for her to feel like she was taking me forward between jumps but by the last few she was starting to get into a nice rhythm. In hindsight I realise that part of this may have been down to her having lost a front shoe early in the course. Despite the disappointing dressage I finished the day being very proud of Coco for jumping clear around a cross country course that claimed many victims. She even finished in the placings in 9th position in a large section. As one of our most local events, Borde Hill is always one that I try to attend. I was pleased to be going this year with Coco, especially on the back of two good jumping runs. 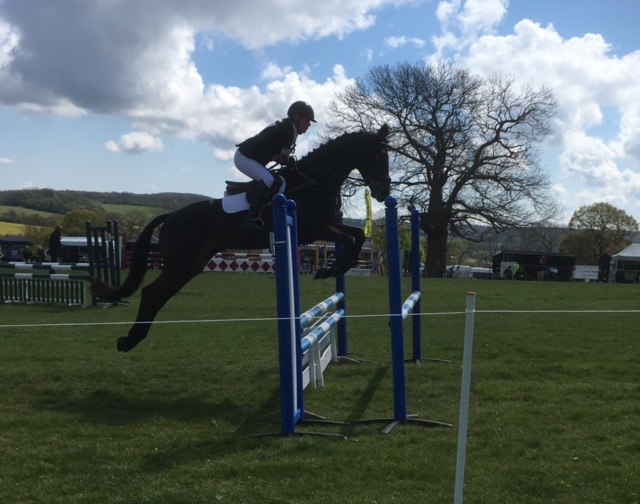 However; I was still a little apprehensive as it always presents a stiff challenge in the show jumping due to the sloping ring and on the cross country again due to the varied terrain. Keen to improve on our dressage score from our previous event, I warmed Coco up for the dressage in a very positive forward manner. I was slightly wary that I didn’t want Coco to get too excited by me pushing her forward but I thought it was better to have her on the aids than too relaxed and behind my leg. In the test this approach seemed to pay off. Coco felt much more rhythmical that she had at Twesledown and all transitions were much smoother. Later on we discovered that the judge had awarded us a huge personal best for Coco of 28.5, a massive step in the right direction. The showjumping warm up was a bit stressful for both of us; the undulating ground and very spread out jumps led to a slightly hectic and chaotic area. I tried my best to avoid Coco getting sandwiched between other horses but the more I tried to avoid it, the more the other horses seemed to canter towards us! Coco hates these situations and got very tense. However; as soon as she enters the ring she seems to be more at ease. She jumped around the course in a lovely rhythm and made it all feel quite easy. Unfortunately due to some holds on the cross country course the cross country was running quite late. I tried to keep Coco relaxed while we waited around but when I got to jumping the warm up fences her anticipation had clearly got the better of her and she had a few explosions! Just before I was called over to start I heard on the tannoy that Coco was actually in the lead in her section, with only two horses left to compete. I tried not to let this affect me or how I was going to ride her in the cross country as winning was not the main aim of the day for us at this stage in her training. When we finally got to the start box she felt raring to go and cantered towards the first jump without needing much encouragement. All the way around the course Coco felt keen and happy to jump everything I presented her to. I still feel that due to her age and inexperience I like to slow her up a little and really set her up for each jump to make sure she has a positive experience and retains her confidence. I was able to then push her on between fences more that I had done previously and she seemed happy to oblige. We finished the course with big smiles on our faces and clear all the way. I picked up a few time faults due to setting her up so much to each jump which ultimately cost us the win but we finished in 3rd place which I was thrilled with. Another double clear and a 9 mark improvement in the dressage phase; what more could I ask for from a star of a young horse? !